Little disclaimer here: at this point, this could technically be the end of week 26 OR week 27, dependant on what scan we go by. I’m yet to have one on the NHS, I’m still waiting on my appointment coming through, and two separate private scans put me a different points. For my own sanity I’m saying Week 26…. It’s crazy doing my first update this close to the end of my Second Trimester, but then again, I’m not complaining, I’ve had the easiest 6 months of pregnancy, ignorance truly is bliss. This week alone has been completely different to the other 25… I am now well and truly pregnant. My belly has ballooned! Or at least, for me, it has ballooned. Up until the start of last week, I had no bump, nothing whatsoever, and now, I feel like it look’s like I’ve stuck a ball under my tshirt! It’s amazing what knowledge can do to the human body; the ultrasound technician at the clinic said it was extremely common between women who were completely unaware of the pregnancy not to show until Week 24, which is about right for me. As for weight gain, I am 11lbs up from the start of my pregnancy, and 5lbs up from 2 weeks ago, so I’d imagine from now it’s just going to spiral. Honestly though, I think a lot of this increase has came from knowledge about the pregnancy. It’s so easy to fall into the ‘eating for two’ mindset, and I’ve definitely let myself go the past week or two. Where I followed a relatively strict macronutrient based approach to eating before, and trained daily, my weight was maintained, and after finding out, at least for all of last week, I essentially dropped all of that. In my head, I was going to get fat anyway, what did healthy eating matter? It took a few days of feeling under the weather for me to realise that that mentality was the opposite of what I need right now - I am now providing for another little person, I am solely responsible for the nutrients he receives, and filling myself with chocolate buttons and chinese takeaways because I’m in a bit of a mood at my chubbier legs is not OK anymore. The aim for week 27 is to get back on my healthy lifestyle, I’ve been back at the gym the past few days, and there’s honestly no reason I cannot be. I’ve dropped to little to no weights in most of my lifts, my cardio is extremely light now and I don’t do anything that puts pressure or strain on my abdomen, and I can honestly say I feel better for it. Pregnancy is not an illness, and it is sometimes hard to remember that. As for symptoms, I’ve not really had any. I get full extremely quickly, which means I’ve been reluctant to eat proper meals and instead reaching for sugar filled quick fixes, but that can be fixed by simply eating smarter. By the same stretch, I’ve not been drinking nearly as much water as I normally would, purely down to the fullness again, it’s uncomfortable, and at this rate, I’ll avoid that feeling at all cost, which I will have to get over. Baby J needs to stay hydrated! My sleeping pattern is fairly consistent at the moment, I wake at 4am every day, wether that’s just to go to the toilet, or just to lay awake and stare at the ceiling for 20 minutes or so, but I always get back to sleep and I feel relatively rested when I eventually wake up. I am ALWAYS tired during the day! The exhaustion is something else, and I am trying so hard not to let myself nap, because it does no good whatsoever, I wake up still tired, but it is extremely testing sometimes, I may as well take advantage though, come October 11th I don’t imagine I’ll be getting all that much sleep! Other than that though, I feel completely fine! Fingers crossed I stay this way..
Baby J is moving a healthy amount according to the midwife, although there doesn’t seem to be any pattern to his movement, or at least not one that I’ve noticed yet. I definitely have been a bit worried as I don’t feel like he’s moving enough, watching other blogs and reading blogs about specific movement patterns and visible kicks left me a bit antsy, but I’ve been reassured everything is as it should be for now, so I’ll accept it and hope he gets a bit more regular next week. I’ve yet to purchase anything this week, I’m trying to get myself through the first two of knowing, and then allow myself to go a bit crazy, Zara Baby is calling my name! 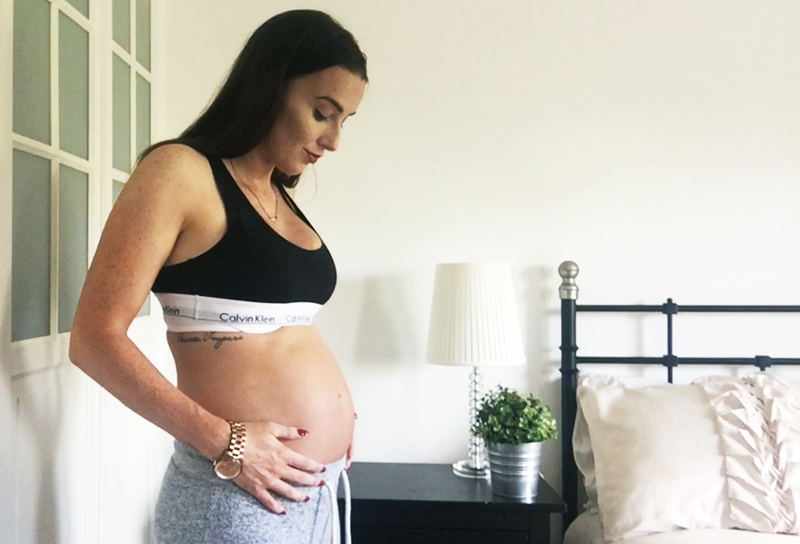 I do have to get the nursery sorted, and we will have to pull our finger out with that, but right now I feel like I need the week or two to get my head around the prospect of our baby, before we start on his room.